The cranberry, along with blue berries and the Concord grape, have a unique and special place in American cuisine. They are the three North American native fruits that are grown in commercial quantities. There are of course lots of other fruits native to North America such as the paw paw and the Saskatoon berry but these aren’t grown commercially. Native Americans used wild cranberries extensively as a food and also as a fabric dye and healing agent. When the European settlers landed, they in turn adopted the versatile cranberry and, in addition to the uses that Native Americans put it to, they also used it as a valuable bartering tool. American whalers and sailors also carried cranberries, which are full of Vitamin C, on their voyages to prevent scurvy. 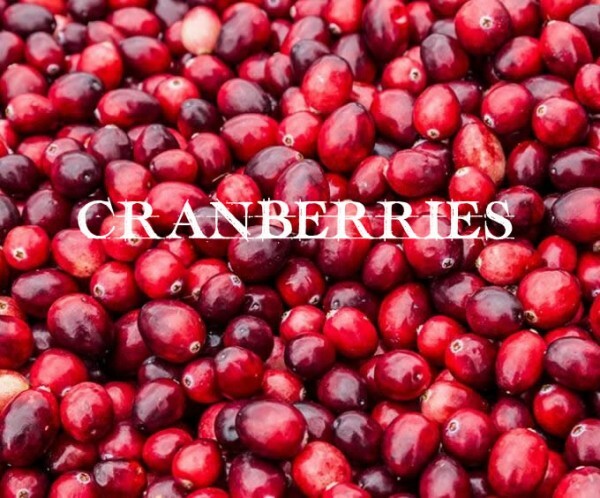 The name “Cranberry” is thought to come from the Pilgrim name for the fruit, “crane berry”. It apparently was called this because the small, pink blossoms that appear in the Spring resemble the head and bill of a Sand hill crane. It has also been called the “bounce berry” because they will bounce when ripe. This is in fact a good way to test for ripeness when you are buying them in bulk. The USA still is the place where much of the world’s supply of cranberries comes from. Wisconsin is the largest producer accounting for over half of the production. Maine is next with 25% or so followed by New Jersey, Washington and Oregon who make up the rest. Canada also produces a large crop of cranberries mainly in Quebec, Nova Scotia, and British Columbia. One of the common misconceptions about cranberries is that they are grown in or underwater. They do require water in the beginning and typically end of their growing cycle. The season begins in Winter when growers flood the bogs with water that freezes and insulates the vines from frost. As the Winter snow melts and Spring arrives, the bogs are drained and the plants grow in dry beds. Blossoms soon appear and in mid-July, petals fall from the flowers leaving tiny green nodes which, after weeks of summer sun, become red, ripe cranberries. Cranberries are typically harvested in September and October. Most cranberries are harvested using the wet method when growers flood their bogs with water. They then use harvesting machines that loosen the cranberries from the vine. With small air pockets in their center, the cranberries float to the water’s surface. Growers corral the berries onto conveyers that lift them from the flooded bog onto trucks and into processing plants. A small percentage of cranberries are dry harvested. This process uses mechanical pickers, resembling lawn mowers with comb-like conveyer belts that pick the berries and carry them to attached burlap bags. If you buy cranberries in a plastic bag, the bag can go directly into the freezer. Bulk cranberries can be frozen in a freezer bag or freezer container. Cranberries will last up to nine months in the freezer. Frozen cranberries can be used in recipes without thawing since frozen berries will be soft when thawed, it is easier to chop or grind them while frozen. During the last decade or so there have been several research studies done that suggest that cranberries are not only a healthy, low-calorie fruit, they may also help prevent urinary tract infections and reduce the risk of gum disease, ulcers, heart disease and may have anticancer properties. Cranberries contain significant amounts of flavonoids and polyphenols which are powerful antioxidants. Antioxidants are compounds that are naturally manufactured by the body and/or are ingested, primarily as components of fruits and vegetables,that have the ability to stabilize harmful free radicals. Under conditions of stress from either internal or external sources, the human body’s ability to produce antioxidants can become severely impaired. There is good evidence that cranberries can serve as a good source of supplemental antioxidants. To put it simply, antioxidants protect our bodies from harmful molecules that we are exposed to every day of our lives. The body produces free radicals through normal metabolic pathways (i.e. extracting energy from the food we eat). Exposure to the sun’s ultraviolet radiation, tobacco smoke, and exposure to certain naturally occurring chemicals can also be sources of free radical production. In short, we are exposed to potential sources free radical production every day of our lives. Following are some of my favorite cranberry recipes. This is one of my favorites not only because it tastes great but also because the color is outrageous! Fresh cranberries are only available for a short time in the fall. You can however use frozen cranberries if you remembered to save some. This makes a great holiday gift. Also, be sure to save the strained cranberries. They make a wonderful chutney or salsa. Rinse cranberries thoroughly and discard any stems or bruised berries. Coarsely chop the berries by hand or in a food processor and add to a clean jar with the rest of the ingredients. Cover and store in a cool dark spot for 3 months. Shake and turn jar every week or so to help dissolve sugar. Strain carefully and bottle with a tight-fitting cap or cork. Allow to age at least one more month before using. Very simple to make and can be used on toast or bagels, as an accompaniment to roasted meats and birds, as a filling for thumbprint cookies, especially good with a cheese plate and or course to dress a turkey sandwich. It has a tart-sweet flavor and the recipe doubles or triples easily so that you can make holiday gifts from your kitchen. Store refrigerated for up to 1 month. You can also process using the water bath method for a shelf stable product that can be stored for up to a year. Cranberries have lots of pectin and thicken all on their own. Bring the apple juice to a boil in a medium saucepan over medium-high heat. Add the remaining ingredients and bring back to the boil. Reduce heat and simmer covered, stirring occasionally, until all the berries have burst, about 10 minutes. Uncover and cook for another minute or two. The mixture will be thick. Strain through a medium mesh strainer, pushing the thick mixture through with a spatula. Discard the solids. Transfer to a container; when cooled to room temperature, cover and refrigerate. This makes a not too sweet palate cleanser when served by itself or a nice foil for fresh tropical fruits like pineapple and mango. My favorite use though is to scoop a small ball into a martini glass and then splash a little vodka over. It’s a fun version of the classic “Cosmopolitan”. Add sugar and water to a small sauce pan and bring to a boil, stirring until sugar has dissolved. Add cranberries and simmer covered until berries have burst, about 10 minutes. Strain mixture through a medium mesh strainer, pressing down gently on solids to extract the juices. Discard solids and chill the mixture covered for at least 2 hours. Stir in the lime juice, liqueur and freeze in an ice cream maker according to manufacturer’s directions. Transfer to an airtight container and put in freezer to harden. *If you prefer a non-alcoholic version you can use one of the orange flavored syrups used to flavor coffees that are now widely available. Here’s a twist on salsa that links Mexico to the North East. It requires no cooking and is an excellent accompaniment to roast turkey at Thanksgiving when both cranberries and tangerines are readily available. I also think it’s great with ham, pork and game, and all kinds of smoked meats and sausages and maybe even on a quesadilla! Wash and pick over the cranberries. Cut tangerines in eighths, peel and all, and pick out all seeds. Place cranberries, tangerines, cilantro or mint, sugar, lemon juice and hot sauce in a food processor and chop in short bursts until relatively fine. Be careful not to over process; you still want some texture. Taste for sweetness and add more sugar if desired. Allow to sit for at least an hour for flavors to develop. Just before serving sir in the nuts and adjust sweet/sour/hot flavors to your own taste. Salsa can be stored (without nuts) covered in the refrigerator for up to 3 days or in the freezer for a month. Add soda mixture and molasses to a bowl. Add 1’2 cup flour and mix till smooth. Add spices, cranberries and rest of flour and mix. Till evenly moistened. Butter the inside of the pudding mold, cover tightly and steam in a covered pot for 1-1/2 hours. Serve hot with sauce. Add ingredients to the top of a double boiler and cook whisking occasionally till smooth. Serve warm. This is adapted from a recipe by that maven of baking, Dorie Greenspan. Center a rack in the oven and preheat the oven to 375°F. Lightly butter eight 1-cup ovenproof cups or ramekins. Put the cups on a baking sheet lined with parchment or a silicone mat. Put all the ingredients in a food processor and pulse just until the mixture forms big curds, about 1 minute. Toss all the ingredients together in a large bowl. Divide the fruit evenly among the cups then spoon an equal amount of topping over each portion of fruit. Bake the crisps for 40-45 minutes or until the topping is golden and the fruit juices are bubbling up around it. Transfer the cups to a rack and let them rest for at least 10 minutes before serving. Serve as is or with a spoonful of crème fraiche or lightly sweetened whipped cream. This was adapted from one of my favorite on-line sources, David Liebovitz (www.davidlebovitz.com) who was a pastry chef at Chez Panisse and now lives the good life in Paris. This cake can also be made in a regular 9-inch cake pan, one that is fine to heat on the stovetop. If using frozen cranberries, no need to defrost them before using. In a 9- to 10-inch cast iron skillet, melt the 4 tablespoons of butter and the brown sugar together, stirring frequently, until the sugar is moistened and liquefied. When the mixture starts to bubble, remove from heat and set the pan aside. In a small bowl, whisk together the flour, cornmeal or polenta, baking powder, and salt. In the bowl of a stand mixer, or by hand in a mixing bowl with a spatula, beat the butter, granulated sugar and lemon zest at medium high speed for 3 to 5 minutes, until very light and fluffy. Reduce the speed of the mixer to medium and add the eggs one at a time, stopping the mixer to scrape down the sides. Stir in the vanilla extract. At low speed, add half of the flour mixture, then the milk, then the remaining dry ingredients, mixing just enough so that they’re all combined. Do not overmix. Distribute the cranberries in the prepared pan over the brown sugar mixture and shake the pan so they are in a relatively even layer. Spoon the batter over the cranberries in four mounds, then use a spatula to spread the batter evenly over the fruit. Bake the cake until the top is golden brown and a toothpick inserted into the center comes out clean, about 50 minutes. Remove from the oven, wait 10 minutes, then run a knife around the cake. Place a serving platter overturned on top of the cake in the skillet, then using oven mitts to cover your hands, flip the two over simultaneously, until the cake releases from the pan. Note: The cake is best made and served the same day, warm if possible. It is also good served at room temperature. This cake isn’t a good candidate for freezing.